where filepath is the path to the file you want to edit (or nothing). The screen is taken over by the program as shown in Figure 1. 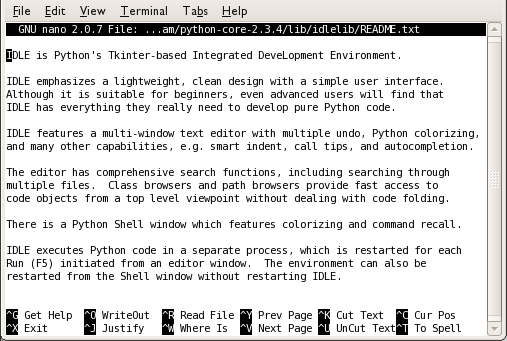 The screen is no longer a place to execute commands; it has become a text editor. To save the changes, just type y and nano prompts for a destination filepath. To abandon your changes, type n.
You can move around the file and view different parts using the arrow keys. This is a very fast and responsive way to explore a file. Be sure to read the man page because it has a lot of good hints. There is help available in your nano session by typing ctrl + g and to get back to your file type ctrl + x.